The church itself is a lovely structure. It was built in 1880 by the Methodist Church of Canada, and became a United Church at the time of the Church Union in 1925. It is constructed of brick, with cut stone dressings, following a Gothic design based on St. Paul's Church in England. The east spire, on the left, was destroyed by a lightning strike in 1964 and later reconstructed. As steeple jacks, (the type prominent in 1881), were not available, changes had to be made to the shape of the spire. It is not as pointed, nor as high as the original one. It is now a truncated copper clad spire. In 1981 the original slate roof was replaced with a steel one, due to increasing damage from the winds sweeping across the St. Lawrence River and the updraughts caused by Allan Hall . The Sanctuary is in an amphitheatre style with the floor rising from the pulpit to the doors bringing the most distant point under the eye and voice of the speaker. The Sanctuary seats 300. The Church, prior to the Seaway project, was situated on Highway No. 2 (Main Street), a city block from the shore of the St. Lawrence River. Today the southern boundary of the Church property forms part of the shoreline of the St. Lawrence River. 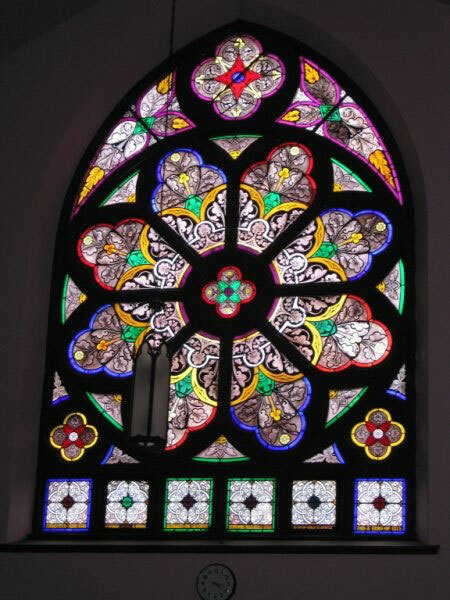 The Rose Window on the north wall is the oldest of the original windows-- it was installed in June 1881.